Paul Pogba is going to leave Manchester United to play for Barcelona. Pogba won’t let a contract with three years left to run at Old Trafford spoil things. 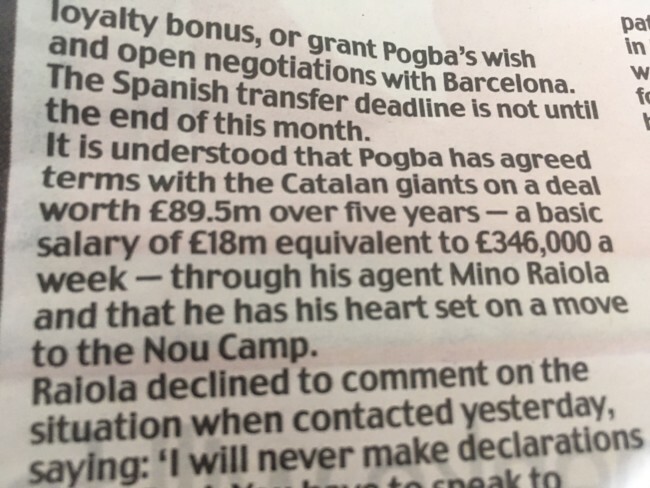 You see, the Daily Mail says Pogba has “told Manchester United teammates that he wants to leave” and “agreed terms with the Catalan giants”. That’s the story – but, if it’s true, isn’t the biggest story one of alleged tapping up? The Mail ‘understands’ Pogba has agreed to break his contract? But how can an agent can get the best deal for their client without testing the market? I LOOK back now and still can’t get my head around half of it; how, in the space of 18 months, the dream was undone so fast. It does my head in thinking about it all: the mess I found myself in, the storm that whipped up around me, the abuse of the fans, the charges laid against me. Overnight, they stopped singing my name and the party ended as abruptly as someone pulling the plug out of the wall. I became the treacherous Ashley Cole, the Judas of Highbury. I was well down on the day when I drove into town to see Jonathan Barnett (my agent) at his offices. We jumped in Jonathan’s Bentley and he told his driver our destination: the Royal Park Hotel. It was Thursday, January 27, 2005. We walked by reception and into a meeting room called the Green Room where we found Pini (Zahavi, Chelsea’s agent) sat alone. We must have been in there about 20 minutes when Pini suddenly flicked his wrist to look at his watch — “Time! Time! My next meeting . . .” and he started to get up out of his chair. The door opened and José Mourinho and Peter Kenyon walked in. I remember noticing Jonathan was gearing up to leave, reaching around his chair for his coat. The small talk, the pleasantries and the goodbyes lasted another 15 minutes as I genuinely saw no harm in being there for a few extra minutes as these two meetings overlapped. Mr Mourinho pulled out a chair and sat at the head of the oval-shaped table and Jonathan was sat to my right. It was normal chit-chat from then on. I mentioned how well Chelsea were doing in the league. “Yes, and we are going to buy two more players — a midfielder and a left back,” he said. Jose Mourinho is the current manger of Manchester United.